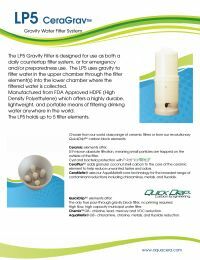 The AquaCera CeraGrav LP5 Gravity Ceramic Water Filter System is manufactured from BPA-free, natural high density polypropylene, which makes it lightweight, portable, and highly resilient. For ease of transport, the upper chamber nests inside the lower chamber to save space. This system accommodates up to 5 ceramic candle filters, which can be cleaned up to 100 times.